Also closed Wednesday, January to March. 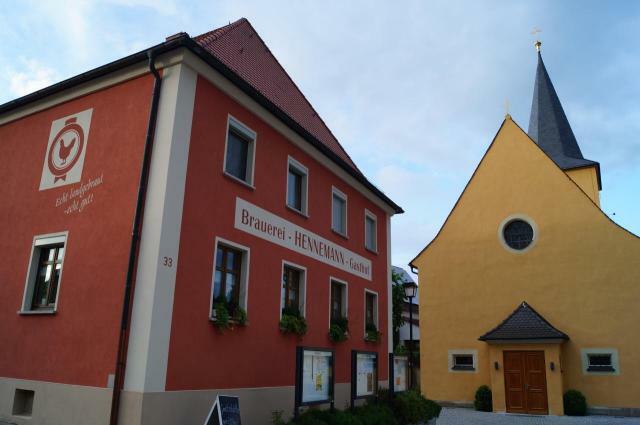 Another typical Franconian countryside brewery, situated in the village center (its a tiny village anyway), right next to the church. Youd be quite unlucky if you didnt see an olden tractor bark by when you are sitting there for a beer or three. Their 2 beers, Zwicklbier and Lagerbier, are remarkably similar, but moreover very tasty and rich, focused on scrumptious malt extraction. They also have a drinks shop behind the brewery, with some soft drinks, their own beers, and the Rittmayer Weissbier. If you feel like getting more beer when youre here, just head in any direction and youll hit another brewery before 3 kilometers. Such is the wonder of Franconia! -A coulis of maple syrup garnishes the full yet discreet sweet malt aroma. -Creamy foam lays upon the glowing russet. -A luscious body galantly develops caramel malt and toastiness. -This is quite simply all about the malts here, beautifully extracted malts. -The supporting hop bitterness is sequenced perfectly. -Could this be an unbunged version of their Lagerbier? Or a younger version? They are so alike! -An exact russet colour replica of their Zwicklbier, with the same creamy head. -Crème brûlée dances for the nose, alongside some candied berries. -Hay-like dryness and grassy hops both rise smoothly in the finish. -Caramel malts and toastiness are gorgeously brought forth. -This is ridiculously similar to the Zwicklbier, in all aspects! Maybe this is simply a longer-lagered version of the first? Still, someone from the brewery confirmed to us that they were both different recipes...Hmmmm. I found the Zwickel quite disappointing because of the lack of aroma, wherelse the lager was very tasty with a distinctive maltiness (caramel, butterscotch...). But it also seemed to be a very light beer. Nice anyway. Pleasant rural brewery. The brownish lager is soft, malty and sweetish with caramel but very little hops to balance. Anyway a very pleasant beer. The Zwickel is more phenolic and harsh. After Aisch, another quick visit with Nick (3/6/17); really nice location for beer garden in shadow of church. Interesting lagerbier, quite malty, not so hoppy but well drinkable. Nick had a seasonal beer, something Gold. Had a sip, very rereshing.